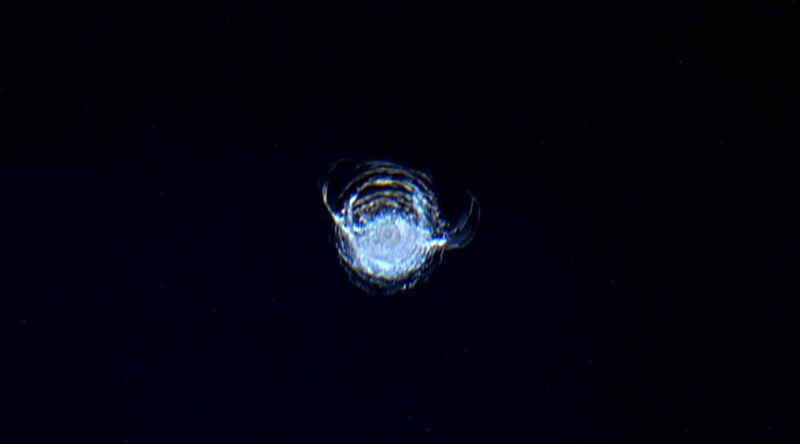 The International Space Station suffers from a problem most motorists can relate to - a tiny crack in one of its windows - although instead of a pebble from the road, this was caused by “space debris” the size of a paint fleck. British astronaut Tim Peake, who is currently on a six-month mission to the ISS, said the chip was in one of the Cupola windows. Although the window was damaged by a tiny piece of space debris, which the European Space Agency says was “possibly a paint fleck or small metal fragment no bigger than a few thousandths of a millimetre across,” a 7mm crack was left. Considering the ISS travels at around 27,000kph, it’s easy for debris to leave its mark, but the windows have been designed to withstand collisions. The windows on board each have four panes of glass ranging from 1.2cm to 3.1cm thick, according to NASA. There’s also an exterior aluminum shutter that can be used for extra protection. Although this was classed as a “minor” crack, larger debris could “pose a serious threat” with debris up to 1cm in size capable of disabling an instrument or a critical flight system on a satellite. There’s no shortage of this type of matter in space either with more than 21,000 pieces of "orbital debris" floating around, all of which can be tracked in real time. “Anything above 1cm could penetrate the shields of the Station’s crew modules,” says Holger Krag, Head of ESA’s Space Debris Office. If the ISS was hit by something longer than 10cm, a satellite or spacecraft could be shattered into pieces. Peake has posted a number of pictures of himself in the Cupola since he began his mission in January.